In a world full of craft beer collaboration, it can be difficult to capture the attention of your average beer fan. In recent times we've seen an array of collaborative efforts, from the mild to the very, very wild. And here's another, with Cheeky Nannup a rarity in Australian brewing: a collaboration between a brewery and a music festival. 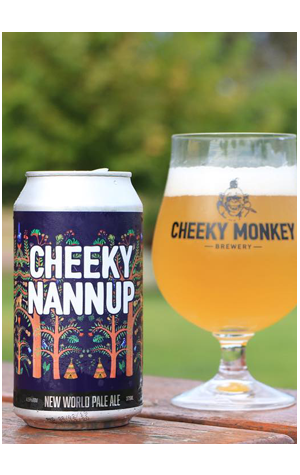 Brewed at Cheeky Monkey with the help of the Nannup Music Festival organisers and performing artists for 2019, Cheeky Nannup is a combined effort to celebrate the folk music festival that's celebrating its 30th anniversary in 2019. "The festival sold out for the first time in 30 years, and Cheeky Nannup sold out halfway through the festival as well! We brewed 2,250 litres of Cheeky Nannup in February, we wanted a beer full of hop flavour and aroma that was also suitable for the diverse bunch of festival goers," says event organiser Nigel Bird. For anyone wanting to get their hands on the limited release, reserve stock was held back for WA retailers. As for the beer itself, Cheeky Nannup is described as a New World Pale Ale. Its light malt base is moderately hopped with El Dorado and Citra hops for maximum tropical flavour, perfectly suited for crushing at music festivals, or anywhere you happen to find yourself.